The start of the sixth plague is the 'drying up of the great river Euphrates'. So it is important to understand what this drying up of the river is, so as to then be able to understand the battle that is to come from it. There are many people in the church today who believe the 'waters' of the river Euphrates to be symbolic of many 'peoples, nations and tongues', just as Revelation 17:15 says regarding the 'sea' which the beast rises up out of. Now it is clear that the waters of a 'sea' in prophecy represents many nations, people and tongues. Which is why many in the church today believe this 'drying up' of the river is a symbolic drying up of many people and nations, more specifically, the drying up of the support of the Roman Catholic Church. But I believe this to be wrong, and I will show you why. Please make note of this important distinction: A sea borders with many nations, which is why a sea is used to represent many 'peoples, nations and tongues' in prophecy. But a river is much smaller and usually only runs through one or two nations. Making a river in prophecy more specific to one or two nations, or a specific people. The 'he' in Daniel 11:45 is the 'king of the north', which is the Turkish empire and the Islamic people. And if you read our page on THE KING OF THE NORTH, you will see that Turkey and the Islamic people, one day soon, are going to 'move' into Jerusalem and place the seat of their authority there. But as the prophecy states, Turkey and the Islamic coalition which makes this move to take control of Jerusalem will 'come to his end'. And what will this do? It will 'DRY UP' the area currently occupied by Turkey and it's Islamic coalition, the area through which the Euphrates river runs. 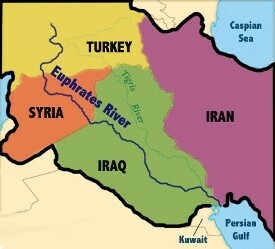 We also have the Euphrates river mentioned in the sixth trumpet in Revelation 9 ... "And the sixth angel sounded, and I heard a voice from the four horns of the golden altar which is before God, saying to the sixth angel which had the trumpet, loose the four angels which are bound in the great river Euphrates. And the four angels were loosed, which were prepared for an hour, and a day, and a month, and a year, for to slay the third part of men." Now the church leaders today accept this literal interpretation regarding the Euphrates river in the sixth trumpet. And yet when we get to the 6th plague, the church leaders believe the Euphrates suddenly becomes symbolic of something else. This kind of study and interpretation is nothing but confusion! The Euphrates river was meant to be taken as a literal interpretation, representing the people and kingdom through which the river flows. Which is different from the waters of a sea, which is to represent many nations and people. That the way of the kings of the East might be prepared? The way to what? Verse 14 and 16 tells us that the kings are gathered to that place called 'Armageddon' or the 'Hills of Megiddo', near Jerusalem, which overlook the plains of Esdraelon, where mighty battles have been fought before by Barak and Deborah destroying Sisera's army, and where Josiah was routed by the Egyptian king Pharaoh-Necho. This final gathering will be 'the battle of the great day of God Almighty'. This is the battle of Armageddon spoken of. A literal battle that will take place under the sixth plague between the nations of the world to gain control of that small piece of land in the Middle East. And what does this mean? It means that another destruction is coming to the nation of Israel and the Jews, contrary to the popular false belief that literal Israel is still God's chosen. Just as the Roman 'armies' surrounded Israel in AD70 and destroyed Jerusalem. The 'armies' of the Arab nations are surrounding Israel today, and the armies of the nations are also getting ready in position, ready for that final battle! Friends, this process of the unclean spirits coming out of the mouths of the dragon, beast and false prophet is already happening today, and will continue building up to the final conflict during the sixth plague. The dragon represents Pagan Rome and the devil himself, as in Revelation 12. So this represents Paganism, the false religious world. The beast is the Papal Church of Rome, and the false prophet is apostate Protestant America. So out of the mouths of the false religious world, the Vatican and the church-state image of the beast in America are coming spirits of demons, deceiving the kings of the earth, in readiness of that final battle. And what has come out of the mouth of the false prophet [apostate Protestant America] recently? To move the US Embassy to Jerusalem, which will only anger Turkey and the Muslim world into taking action! The signs are all there to see, so that we will have no excuse not to be ready. Turkish Govenor declares that Turkey's forces would soon march into Jerusalem! It is interesting to note that the Papal Church of Rome and the world have long tried to control Islam. But as God prophesied in Genesis 16:12 concerning Ishmael ... "And he will be a wild man; his hand will be against every man, and every man's hand against him; and he shall dwell in the presence of all his brethren." ... There is no taming the Arab world, and one day soon the Arabs will once again come together to make war and conquer Jerusalem, with Turkey, who is by far the most powerful Muslim nation in the world, as the leading nation. But as Daniel 11:45 says, he will come to his end this time and none shall help him. THEN the Battle of Armageddon will take place. THEN Jesus will return! Didn't Jesus say in Revelation 16 that He was going to come 'as a thief'? Is the 'harvest ripe' when He comes? Yes, so this 'gathering' in Joel is the same gathering that occurs under the 6th plague, where the kings are gathered to the battle of Armageddon near Jerusalem. The 'valley of Jehoshaphat' is also near Jerusalem. But notice something very intersting. 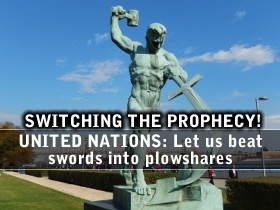 This prophecy in Joel says that the men are to turn there plowshares into swords. And yet look at the picture of the statue in the United Nations garden. It is of a man turning a sword into a plowshare, the opposite of what God prophesied. The world wants to reverse the prophecies of God, but as we know, the prophecies of the Lord are certain and will happen. But be warned friends, as the battle of Armageddon takes place AFTER probation has closed, because it happens during the 6th plague. So it will be too late to get ready when that battle comes. We must get ready NOW. Time is running out and we must surrender all to Jesus Christ today. Don't put it off, give your all to Jesus now and let Him take control of your life.